Catholics are unique among Christians in believing exactly what Jesus told us in the Bible: The Eucharist is not just a symbol. It is the true Body and Blood of Jesus Christ, able to be consumed by us under the appearance of bread and wine. This is the source and summit of our faith, one of the greatest blessings of being Catholic. First Holy Communion for children is administered in the spring of each year after Easter, generally to those in second grade. Preparation is conducted through the Parish School of Religion (PSR) or the parish elementary school. First Holy Communion for adults is generally administered at the Easter vigil along with Baptism and Confirmation for those who have completed the Rite of Christian Initiation (RCIA). At Ascension parish, everyone of every faith – or no faith at all – is welcome to attend Mass. At Communion, those who have not made their First Holy Communion in the Catholic Church, or are not in a state of grace, are invited to process to the priest for a blessing. Simply indicate you wish to receive the priest’s blessing by folding your arms across your chest, with your hands at your shoulders. The United States Council of Catholic Bishops provide further guidelines for the reception of Holy Communion. The precepts of the Church require Catholics who have made their First Holy Communion to attend Mass on Sundays and holy days of obligation, and to receive Holy Communion once a year. In fact, we believe that receiving Jesus in the Eucharist is so essential to maintaining closeness with Him, the Church allows the faithful to receive Communion up to twice a day! 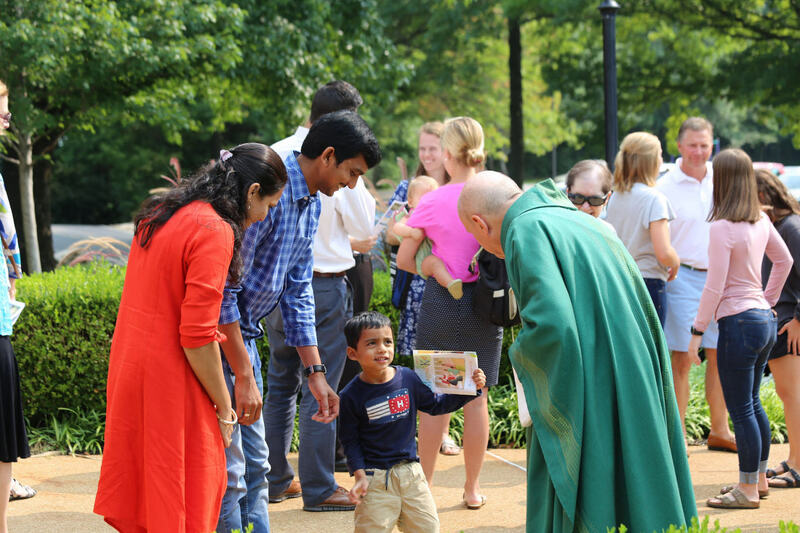 Ascension makes it easy to receive Communion regularly through the many Masses we celebrate.